It might not mean much to others, but the truth of the matter is that our vending machine at work hasn’t had Mountain Dew in it for months and this has been bothering me. It isn’t so much that the lack of my favored green nectar missing annoyed me, if it was a Coke machine it wouldn’t have even have occurred to me to lust after it. The problem began and ended with the fact that there was a picture of a emerald colored can of Dew right in the center of the machine, but none to select on the side. The place that it normally would be had a cardboard, I think from a box for some unknown reason (why not paper escapes me as my office has literal tons of that), saying something about fruit juice. Once again, that is fine, there is plenty of other drinkable solutions in this area, but it was the promise of something that was more caffeinated that was upsetting me. 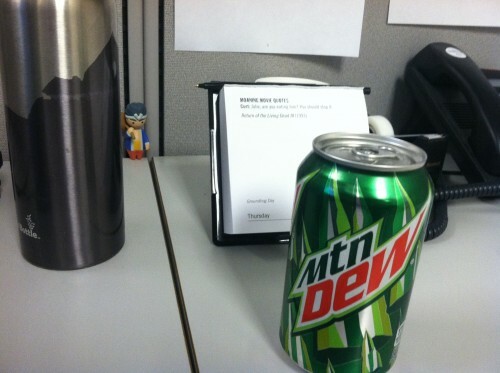 Well the other day the cardboard cutout in bad handwriting was replaced with one saying, “Mountain Dew,” which made me both happy and interested in what happened to the insert that was clearly part of this process at one point (did they throw it away? Why? Who was running this service that these inserts were hard to come by?). Needless to say I purchased one today, mainly because it is the first time I have had any kind of non-debit card monetary amount on me. To sum things up in a non-interesting way, it was awesome. For those paying attention you can clearly see the zombie calendar directly behind it. It is so hit and miss that I almost look forward to reading the next day’s information. Half of it is so terrible that I want to throw the thing away; the other half is kind of interesting and almost makes me think that the entire experience is clever. The topic of this long awaited update is “Zombies and Mountain Dew”.Awesome.